Join us for this annual tradition! It’s a free class – but we accept donations to help purchase gear and equipment for needy students. See you on Turkey Day! 9am sharp. This entry was posted in News & Events on November 18, 2016 by pmaadmin. 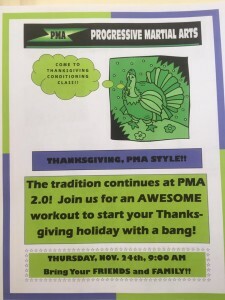 SO THANKFUL FOR OUR PMA FAMILY! HAPPY THANKSGIVING!